Back in 2010’ish I made a spur of the moment decision and signed up for a kiteboarding lesson to see what it was all about. I met Captain Billy Stark simply by chance (and good fortune). Captain Billy teaches from a boat, a very comfortable boat, especially when you need to take a break, grab a snack, or switch gear – and you will. The lessons are well structured yet at the same time seem personally catered to my ability and skill level. Due to my own shortcomings (no previous board sport experience) I progressed SLOWLY but eventually got it thanks to Captain Billy’s endless patience, incessant safety precautions, telling me when to take a break when I didn’t want to, and pushing me when my confidence wasn’t up to the task at hand. I have so much confidence in Billy’s kiteboarding instruction I asked him to teach my son to kiteboard when he was 10 years old. I knew Chase wouldn’t have any trouble learning the sport - he had about four years of snowboarding experience. I was more concerned about safety, and when it comes to entrusting my son’s safety to someone the bar is set very, very high. I didn’t have to give it a second thought when it came to Captain Billy. Over the years I’ve taken to jumping – the higher the better – it’s an experience and adrenaline rush that cannot be put into words. Chase is catching up quickly - it won’t be long before he will be out jumping me – it will be a bittersweet moment. My son and I have enjoyed countless memorable kiteboarding trips to Hatteras thanks to Captain Billy Stark, the conscientious, safety obsessed, charismatic, thoughtful, and all around great guy who is obviously passionate about teaching kiteboarding. 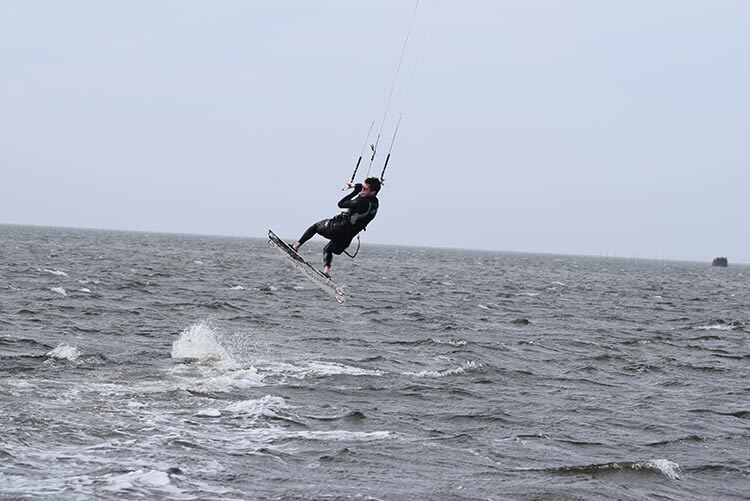 "I chose Cape Hatteras Kite boarding and Captain Billy Stark for my camp based on the individual attention, the availability of nice, new gear and his unique learning platform- HIS BOAT!" I came to Hatteras this spring with the specific goal of learning to kite board. Withing a few days I wanted to be able to get up and ride on my own, go both ways and be able to stay up wind. I chose Cape Hatteras Kite boarding and Captain Billy Stark for my camp based on the individual attention, the availability of nice, new gear and his unique learning platform- HIS BOAT! On the very first day Captain Billy had me up and riding, going both ways and having a blast right out of the gate. With him following me in the boat, no obstacles or others around I was able to focus on riding the board and flying the kite. On the first day I made several rides both ways and covered considerable ground downwind. With the boat he was able to pick me up and get me right back where we started for another round. On the second day we focused on advancing my edging ability and staying up wind. The wind made some changes throughout the session but since Captain Billy had multiple pre-rigged kites in the boat making changes took only moments. The third day was a breakthrough for me. Out on the sound, no obstacles, shallow smooth water and personal one on one coaching for the first time Captain Billy was able to throw out the anchor and I made it back to the boat. I was able to ride upwind! At this point I was no longer worried about going out on my own and not making it back to where I started. I have spent the last fifteen years of my life surfing from Samoa in the South Pacific to Nova Scotia in Canada and everywhere in between. I have skate boarded all over the country with some of the best skaters of our time. My wife and I just spent the last three winters snowboarding in Montana where I ran events and spent considerable time in the back-country and going off large jumps. 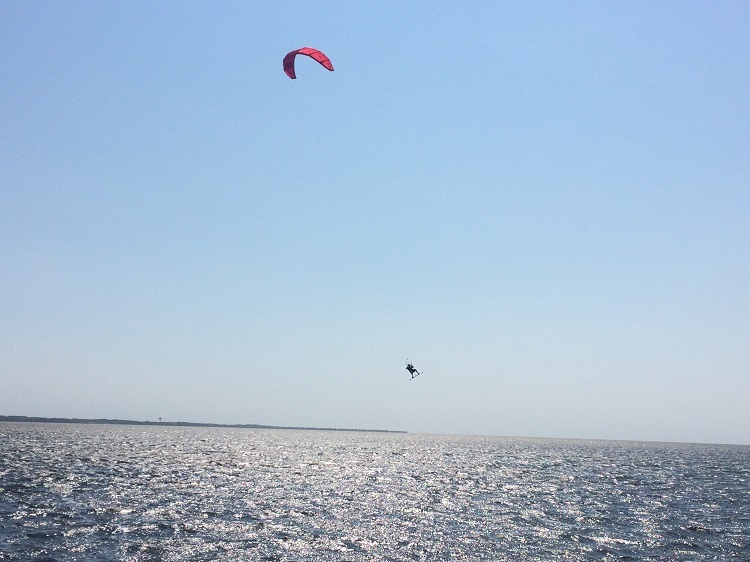 I knew that coming home to the Outer Banks I had to add kite boarding to my board riding repertoire. I now feel 100% confident going out on my own, advancing at my own pace and enjoying the windy, warm days of summer. Thanks a Ton Captain Billy!! "I just want to thank Captain Billy Stark for my intro to kiteboarding"
Safety was my first concern. Being 56 and packing at least an extra 20 pounds – I was nervous about getting beat up or even worse - hurt. My fears where calmed by the “learn kiteboarding from the boat in shallow water method” used by Captain Billy. Lots of time to learn how to fly the kite SAFELY, body drag, ride a kiteboard, and this all happens while being able to stand up in waist deep water. Safety Bonus – the kiteboarding lessons are way away from the beach and away from distractions, like other kiteboarders and windsurfers (and laughing friends and family). I think the best thing is having Billy following along in his big Carolina Skiff to help when you crash and explain why and how to avoid doing it again. Even better was having a great security blanket - I really liked knowing Captain Billy was there to help if I really blew it. Safety first, learning and fun second, was a great introduction to my new sport. I would advise anyone wanting to learn kiteboarding that you MUST take an INTRODUCTION LESSON to avoid being a statistic. Kiteboarding is easier to learn than windsurfing but you need to learn SAFETY from a PRO to be safe and Captain Billy is the man!